Hello everyone! My dear blogging friend Rachel has kindly offered to let me guest post for her while she's off politicking in Georgia, and I'm so delighted to be here! Let's start off this post with a picture. Pictures are worth a thousand words and all that, so without further ado... here's one that makes me all kinds of annoyed. Lately I've heard a great deal about dialogue tags in writing, and I am here today to tell you a great and important truth. Sit up straight, take the Popsicle out of your mouth, cross your legs neatly and the ankles and listen closely. There is nothing wrong with the word "said." "Said" has been getting a bad rap lately. It seems that everywhere I look, writers are advising each other not to use that word, because something bad will happen if they do. Their books will become dry and hard to chew, the dialogue will turn clunky and the characters will be stuck in a monotone. Or so you might think. There's a phenomenon in writing--especially material written by young writers-- that I like to call the Mrs. Palmer effect. Mrs. Palmer, in case you don't remember, is a character in Jane Austen's Sense and Sensibility. In the 1995 film she remarks that Marianne Dashwood will certainly be soaked to the skin after going out in the rain, to which her husband replies, "Thank you, my dear, I think we have all apprehended that much." When someone writes a sequence of dialogue like this (see below), that's what I call the Mrs. Palmer effect (because it's easier than calling it the Thank-you-my-dear-I-think-we-have-all-apprehended-that-much effect). "Please go with me to the party," Lisa begged. "No, I don't want to!" Sandra yelled loudly. "You are just so mean," Lisa insulted. "Take that back," Sandra snapped angrily. "Girls, stop arguing right now," their mother scolded. "Mom, pleeeeeeease make her go to the party with me," Lisa whined. " I'm not going and that's final!" Sandra exploded. Oh, cringe. Now, of course, that was an example of the worst of the worst, made up entirely by me. I didn't copy it from a book, nor did I base it on anything I've actually read. But believe me, there is writing--published writing--out there that sounds... well, like that. Ugh. Here's the same conversation, reworked. "Please go to the party with me." Lisa plopped on Sandra's bed and tweaked the book out of her sister's hands. "No, I don't want to!" Sandra snatched the book back. Lisa scowled. "You are just so mean." "Take that back!" Sandra snapped.
. "I'm not going and that's final!" Sandra scooped up her book, scrambled off the bed, dove into her closet and slammed the door. I'm not going to insult your intelligence by asking which paragraph sounds more natural. Obviously the dialogue itself is cheesy and uninteresting, but I think you'd agree with me that the action surrounding the conversation in the second version is much better than the stilted synonyms for "said" in the first. I didn't take out all the dialogue tags, however-- Sandra still "snaps" in the fourth line. In this case, I felt that saying "snapped" was justified. It isn't evident from her words that she was snapping, and Mr. Palmer has no reason to thank his dear and tell her that everyone has apprehended that much. Another thing I changed in the second paragraph was the use of adverbs. In the first paragraph, Sandra yelled loudly and snapped angrily. Well, of course she yelled loudly. That's what yelling is: loudness. Thank you, my dear, I think... And since we were told that she was snapping at Lisa, we don't need to be further informed that she did it angrily. I've never heard anyone snap sweetly. But even if you aren't being ridiculously over-redundant (see what I did there?) 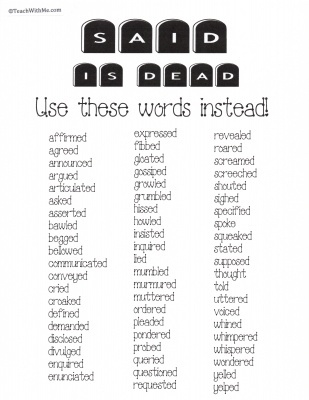 you can still fall into the trap of adding an adverb after every "said." I know because I used to do it all the time. He said suavely. She said coldly. He said arrogantly. She said disgustedly... Blah-de-blah-de-blah. "Said" is not a baby. It can stand alone. Really, it can. It's been around for a while and doesn't need an adverb to hold it up. Unless, of course, you are Agatha Christie. In which case you are permitted to use tons of adverbs in your dialogue tags because they just seem to fit somehow, and besides, everything else you write is sheer genius anyway. But most of us aren't Agatha Christie. (If you do happen to be Agatha Christie, please leave a comment on this post and make my day.) In conclusion (I do like saying that, it makes everything seem much more important somehow), the way you write your dialogue is completely up to you. I am not the boss of you, nor am I the expert who knows how to fix everything that's wrong with your writing. (If, that is, there IS anything wrong with your writing.) I'm just a scribbler with an overcritical eye, a zest for perfection and an abhorrence of unnecessary synonyms for "said." And, too, maybe I just over-emulate those crotchety writing critics in the Anne and Emily books. Go ahead and cut out all those flowery passages. Skip the sunset, too. And ditch that sap Percival who sits around mooning all the time and never lets a girl get a word in edgewise. In real life she'd have pitched him.